It's time for another GIVEAWAY!! This one is coming from Daisy Cottage Designs and with summer just around the corner, NOW is the perfect time to win these items! This would make for a GREAT gift too! Daisy Cottage Designs specializes in handmade crocheted beanies, owl hats, and photo props for newborns, babies, children, and adults and I'm telling you they are simply A.D.O.R.A.B.L.E!! 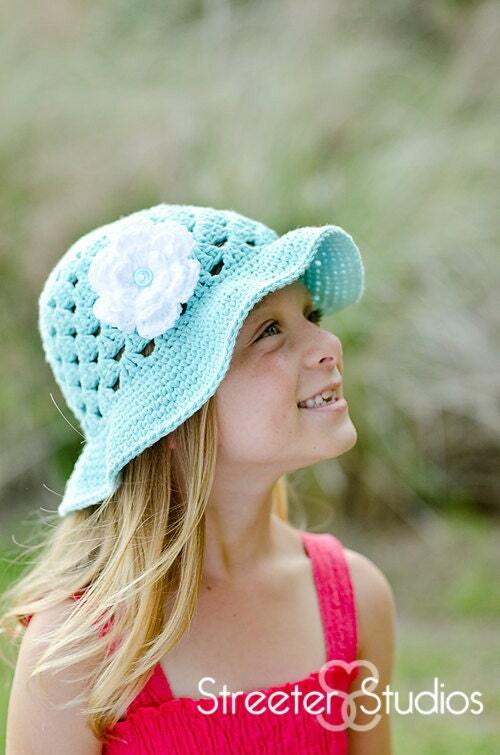 Enter NOW to WIN this sun hat and a headband!! 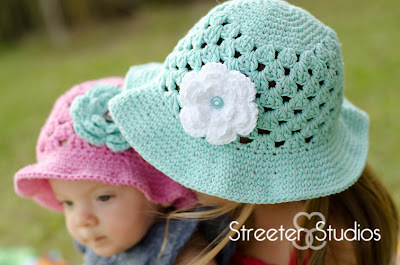 You get a robin's egg blue crocheted hat with a white, detachable flower. AND... You also get a HEADBAND too!! Daisy Cottage Designs is willing to let the winner choose the colors of the headband and the winner can also choose a different size, if they'd like to use it as a gift or for a different child. Be sure to check out the Daisy Cottage Designs ETSY shop. * Be a Delightful Order follower with Google Friend Connect and leave a comment at the bottom of this post telling me that you're a follower. * Become a Delightful Order FACEBOOK fan or Twitter follower and leave a comment at the bottom of this post telling me that you're a fan or a follower. * Become a Daisy Cottage Designs blog follower and leave a comment at the bottom of THIS post telling me that you're now a follower of her blog. * Grab the Delightful Order button (be sure you take the entire code) and post a LINK to this giveaway on your blog or facebook page, inviting your friends to enter to win and leave a comment at the bottom of THIS post telling me that you did just that. Interested in advertising your blog or business on Delightful Order? View my CONTACT ME & ADVERTISE page for our current advertisement opportunities. im a face book fan and also shared the link, so 2 entrees i beleive, great products definately recommend!! I'm already a follower! Woohoo! What beautiful items. Thank you for this giveaway! Im a Facebook Fan i follow your blog and now im signing up for e mail :) LOVE LOVE LOVE your products!!!! I'm a delightful order follower... love the giveaway! Thanks! 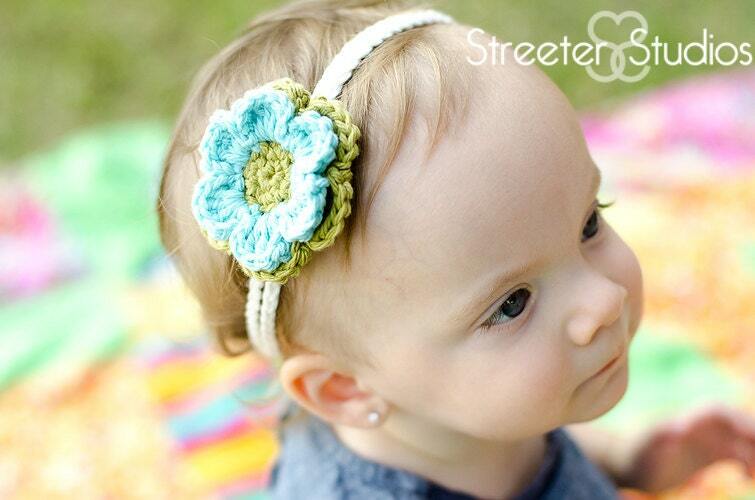 These hats and headbands are absolutely adorable!! I am a FB follower and follow the blog.. Thanks!! I'm a follower - and I would LOVE to win this for my niece! I'm a Delightful order facebook fan! I'm a Daisy Cottage Designs Follower! I am a follower! This is a beautiful hat and headband! I'm a follower of Delightful Order via GFC! I'm now following the Daisy Cottage Designs blog! I am a Facebook fan! :) Love what you do! I'm following Delightful Order on GFC! I like Delightful Order on Facebook user Lisa Garner. I'm following Daisy Cottage Designs on GFC. I absolutely think these are adorable!! My daughter-in-law & son are due with their baby girl in August and these would look so sweet on her!! I would love to win them.. Thanks for the chance..